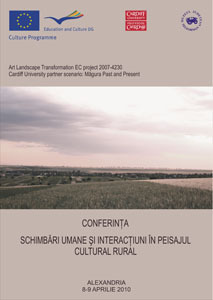 This conference took place at the Teleorman County Museum and in Măgura on the 8th and 9th April 2010. Drawing on new and emerging research perspectives, the main aim of the conference was to study and document the historical development of Măgura village in its rural landscape setting. Historical themes addressed include: settlement location; the development and provision of architecture, housing and local facilities; and the impact of wider social influences. In addition, the conference aimed to identify new areas of research on traditional village life and material culture thereby driving forward local and regional heritage studies. The conference attracted 25 specialists (village, rural landscape and architectural historians and heritage and planning officers) from across Romania who gave presentations on the documentation and presentation of Romanian village life and policies to preserve village heritage. Please visit the Media-Resources section to view the conference programme [pdf, 1mb] and conference proceedings [pdf, 19mb].